Oh my, didn't this week fly by! Thankfully it's been all good. Birthday celebrations have spread well into the month now. 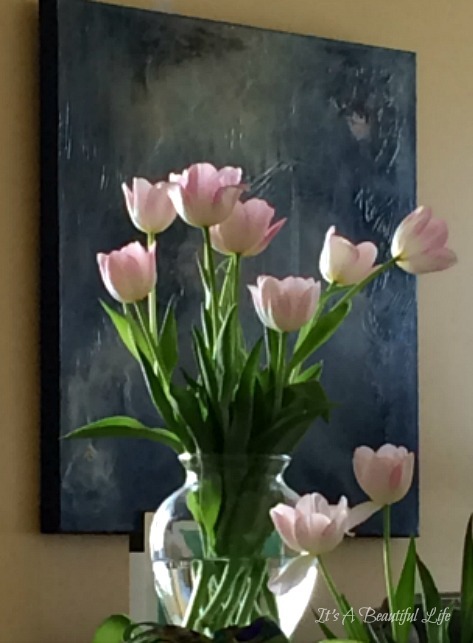 These pink tulips, a gift from a dear friend, sat on my dining room table all week. Aren't they striking against the blue painting? And I love how the light seems captured inside the vase. 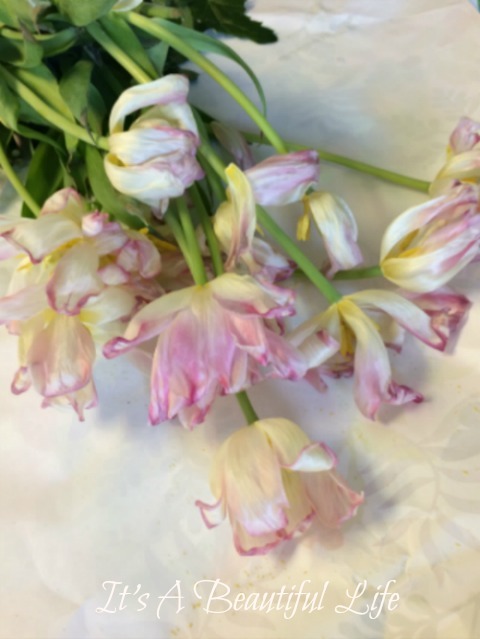 I posted my photo on Facebook the other day, and someone commented that "it looks like the tulips came off the painting and onto your table". It almost looks that way ... art and life mixing. We're working out in the yard and watching for signs of an awakening garden. 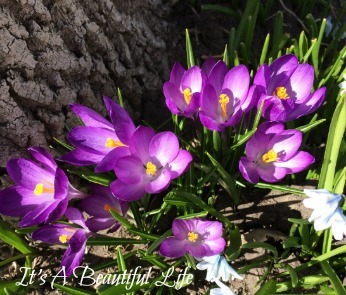 With all the bird calls in the air and finding sweet blossoms of crocus nestled against the tree trunk in the front yard, we know it's Spring, it's Spring, it's Spring! And, then we're having the very great pleasure of reading something oh so wonderful. 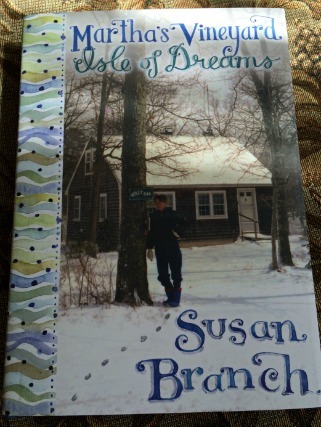 I am in the middle of Susan Branch's newest book Martha's Vineyard: Isle of Dreams. It's the last in her trilogy (The Fairy Tale Girl and A Fine Romance) and I am L-O-V-I-N-G it! It arrived in my mailbox in time to join in the birthday festivities. The best kind of birthday present. Below is a peek to whet your appetite, in case you haven't got it yet. I am really trying to read it without hurrying too much but it's a page turner. 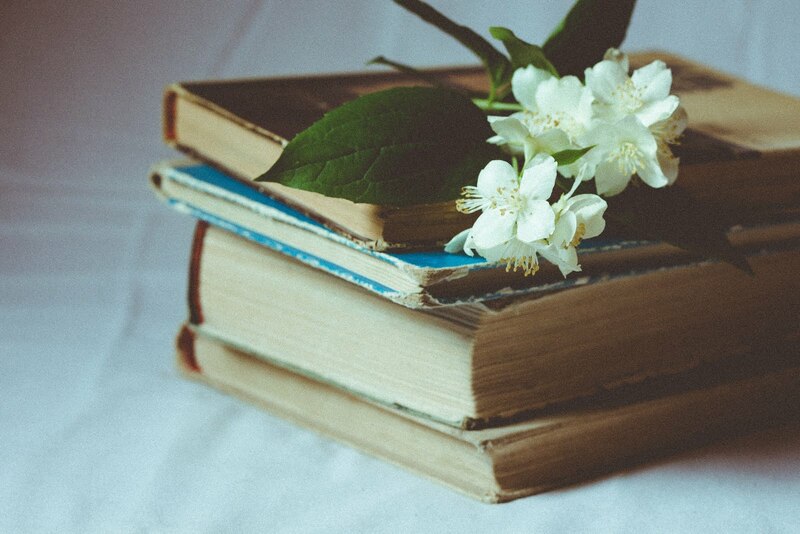 My consolation is if the book ends far too quickly, I can do a happy dance, turn around, and read it all again. Once I know how the book ends, I can relax into the actual story and begin to savour; in this case, to savour Susan's lovely artwork in detail, ponder the cute and pithy sayings she's included for our mirth and pleasure, share the journey with some tears, great laugh out loud moments; not to mention, nodding in total recognition of a kindred spirit -- for even though our life stories are completely different, there is so much that resonates and is the same. As a young woman Susan knew she wanted to change the world -- well, she certainly has made the world a better place with her cheerful, resolute, and generous spirit -- not to mention, her endearing books and artwork. She sure has delighted the lives of many 'girlfriends', including this particular one! Susan is hosting a giveaway of some real treasures right now. To enter, leave a comment on her post by popping over here. 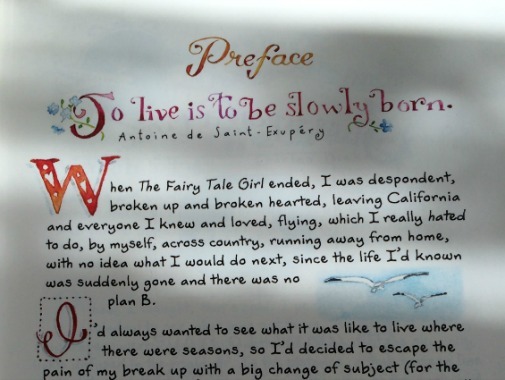 Today, as I'm joining Five on Friday, I'm sharing five quotes Susan shares in her new book. They are now jotted in my own journal for safe keeping. I hope they whet your appetite to get the book, if you haven't already done so. For, of course, you will then learn why these are so meaningful when you read them within the context of her delightful story. "As long as I have a window, life is exciting." "Glory be to God for dappled things." it is also full of the overcoming of it." "But listen to me. For one moment quit being sad. Hear blessings dropping their blossoms around you." Another view of my pretty tulips. Today their pink petals are so translucent and shimmery. Even as they are drying and dying, they offer a different glimpse of beauty. Goodness to the last petal. On that note, I'm wishing you a wonderful weekend! A beautiful post the tulips were a feast for the eyes and the quotes a real delight. Have a wonderful weekend. I so enjoyed visiting your blog and seeing your lovely tulips (gorgeous in the first photo against the blue!) and appreciated the quotes from Susan book--definitely a book to be savored, as you say. Hope you're having a good weekend. Happy Belated Birthday! Your tulips were beautiful. You've shared some lovely quotes and I do like how you've displayed the fading tulips. The tulips are beautiful. And they certainly are stunning in front of the blue painting and as they are "dying and drying" as you say. I am glad that you enjoyed the trilogy. I really need to catch up. Susan is an inspiration to so many! Glad to hear that you've had a wonderful birthday month. Susan Branch's trilogy is on my loooong list of to-read books! Those tulips are just the shade I was hoping for when I planted some under the Magnolia. Unfortunately they have come up yellow! They may fade and change so I will give them a chance. Thank you for visiting. We share a beautiful birthday month. Just so you know, Susan Branch's books are non-fiction. These three I mention are about her life story. Fairy Tale starts the story, Isle of Dreams tells of when she moves to Martha's Vineyard, and A Fine Romance is a delightful account of the trip she and her Joe take to England in 2012. All three include her wonderful artwork as well as fun things like recipes, photos, and tips that help tell her memoir-like story. 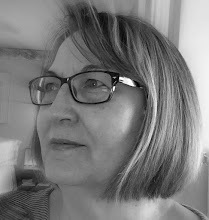 I'm a bit behind with my blog reading but would still like to wish you a very happy birthday, dear Brenda. May all your days be filled with fun and fantastic things. 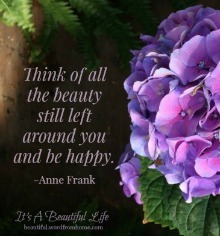 Beautiful flowers, beautiful quotes and such a beautiful blog! Happy Birthday Month! Those tulips are truly a lovely color, probably like the "color" of all your birthday remembrances and celebrations. Thank you for the Susan Branch quotes! Oh dear . . . how did I miss your birthday?! Well, I do hope it was a happy one. It sounds like you celebrated it properly -- all month long! The tulips are beautiful -- yes, that first picture is a work of art. Sounds like a lovely book. I spent some summers on Martha's Vineyard; would love to read this book.